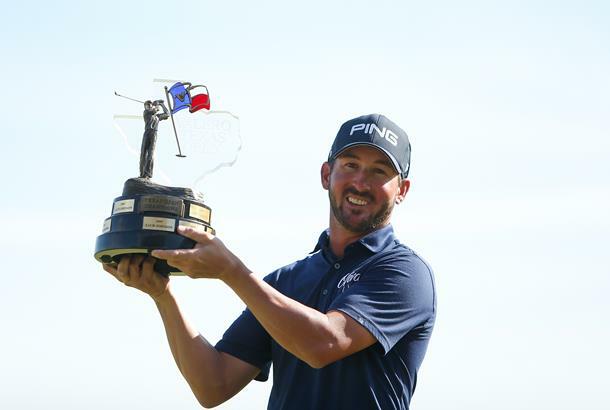 Andrew Landry became the second player in a row to win their maiden PGA Tour title at the Valero Texas Open with a two-shot victory on Sunday. Landry's first PGA Tour victory comes in just his 32nd career start on Tour, having held his nerve on the back-nine to beat Trey Mullinax and Sean O'Hair by two shots. The 30-year-old began the day in a tie at the top with Zach Johnson, but quickly assumed the outright lead with birdies on each of his three opening holes. A further gain on the 6th moved him to 17-under-par, and another on the 10th moved him three shots clear. A mistake on the 11th and a birdie from Trey Mullinax, who shot a course record 62 on Saturday, reduced his lead to one, and mistakes looked to be creeping in when he went on to miss a short four-footer for birdie on the 12th. Another short birdie miss from inside four feet on the 14th lost him a second chance to increase his lead, but as Mullinax could only manage a par himself after hitting in to the bunker with his second, the gap remained at one-shot. While Landry's mistakes were missed birdie conversions, it was Mullinax who made the untimely error that ultimately would cost him his shot at the title. Mullinax played the 17th hole agressively with his driver, leaving himself just a wedge over a bunker in to the green, but nerves showed as he chunked his second in to the bunker and ended up with a bogey to gift Landry a two-shot lead heading down the last. Pars from both men on the par-five 18th meant it was the Texan native who lifted his maiden PGA Tour title, while Mullinax would finish in a share of second after Sean O'Hair chipped in for a birdie on the final hole. Is this victory the one that opens up floodgates for Landry? "I hope it does," he said. "I hope it opens up for a bazillion of them." Behind Mullinax and O'Hair were Jimmy Walker (-14) and Zach Johnson (-13), who couldn't manage more than a level par 72 at an event he's previously won twice. However, it was a particularly impressive outing for former World No.1 Amateur Joaquin Niemann, who finished in 6th place thanks to a final round 67 in his first PGA Tour event as a professional.